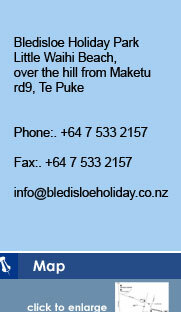 Bledisloe Park: Is a great spot if you enjoy fishing. It has something for everyone. Fish with the kids in the eastury, surfcasting from the beach, or take the boat out for some great fishing. There is an abundance of Shell Fish with Pipis and Oysters right on your doorstep and Muscles only a few minutes walk along the beach. You could bring no food and still eat like a king.